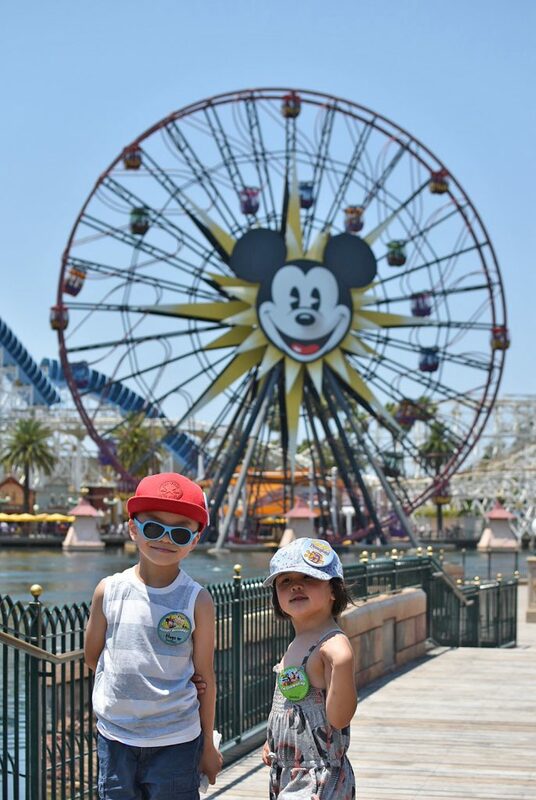 This summer my brother surprised his son with a birthday trip to Disneyland where the whole family came along too. I’d been to Disneyland nearly 10 years ago and Mike and I had been to Disney World together just a few years ago, but this would be our first trip with little ones (niece and nephew). 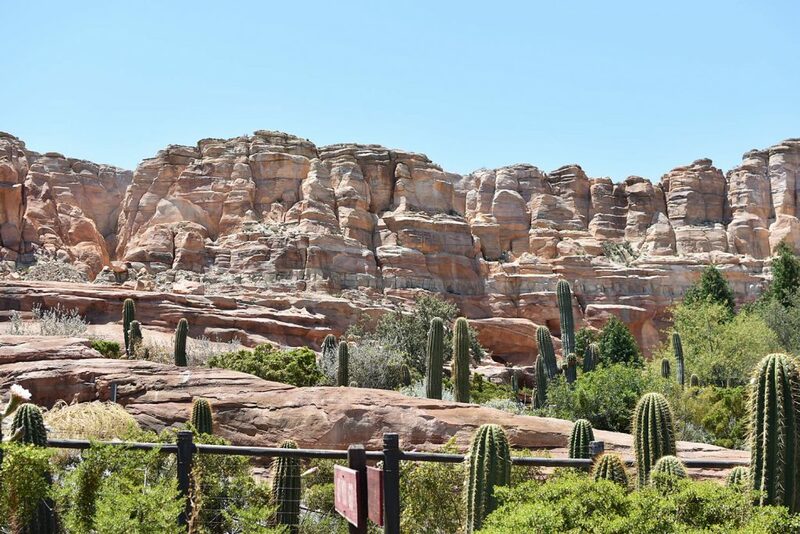 We went on some rides with the kids and some rides on our own, and below is my list of Top 5 Best Rides at both Disneyland and California Adventure (as per our tastes), plus a few honourable mentions. You can also check out my round-up of best fun foods to try at Disneyland California Adventure too! 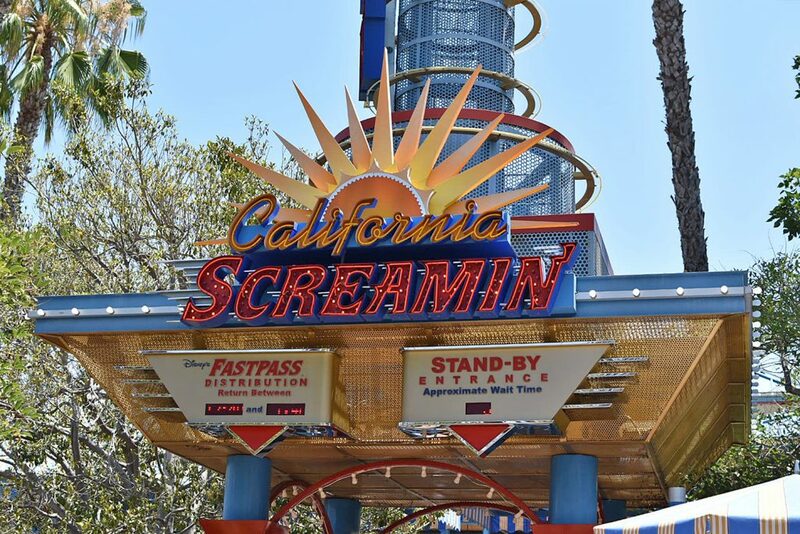 The California Screamin’ is an awesome rollercoaster at Paradise Pier California Adventure! One of my favourite parts about going to amusement parks is that Mike’s comfort zone is pushed just a little bit further each time. When I first met him, he was afraid of going on any high height or speedy ride. During this trip, he was able to go on the California Screamin’ rollercoaster at California Adventure (which includes an upside down portion) AND he loved it so much, we went twice in that same day! It also helped that for some reason the stand-by entrance wait was only 5 minutes both times (what!) so we really lucked out when we went. This rollercoaster takes you up almost 120 feet and then plunges you all over Paradise Pier. It’s the longest and fastest roller coaster at Disneyland and also the funnest. The loop-de-loop and whirlwind start makes it look a bit scary but it isn’t! This is a must ride at Disney California Adventure! Must be at least 48″ to ride. 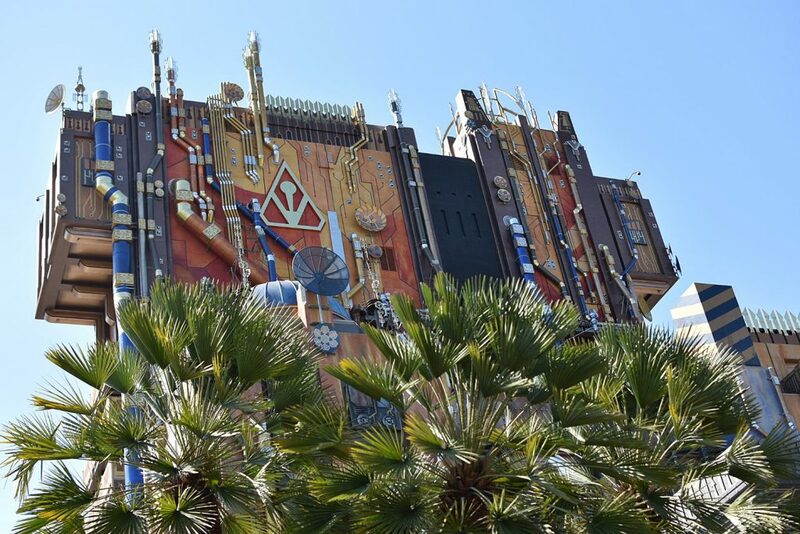 The new Guardians of the Galaxy Mission: Breakout ride (formerly Tower of Terror) at Disney California Adventure. No one in our party had been on the Tower of Terror ride before and now we can’t (at Disneyland anyway) because it’s been turned into the new Guardians of the Galaxy Mission: BREAKOUT! ride. The premise: The Collector has collected the Guardians of the Galaxy and you’re able to go glimpse them in public for the very first time at his fortress in California Adventure! One snag: Rocket the Raccoon has been waiting for you to arrive and help him break out his friends. This ride takes you to the top and bottom of the fortress (or the “up and down ride” as my niece and nephew call it) with your screams set to the sweet soundtrack of Star Lord’s awesome mixtape. This elevator lift ride will have you flying off your seat (literally) and wanting to come back for more (which we did! This was another ride we rode twice). Totally awesome. Must be at least 40″ to ride. 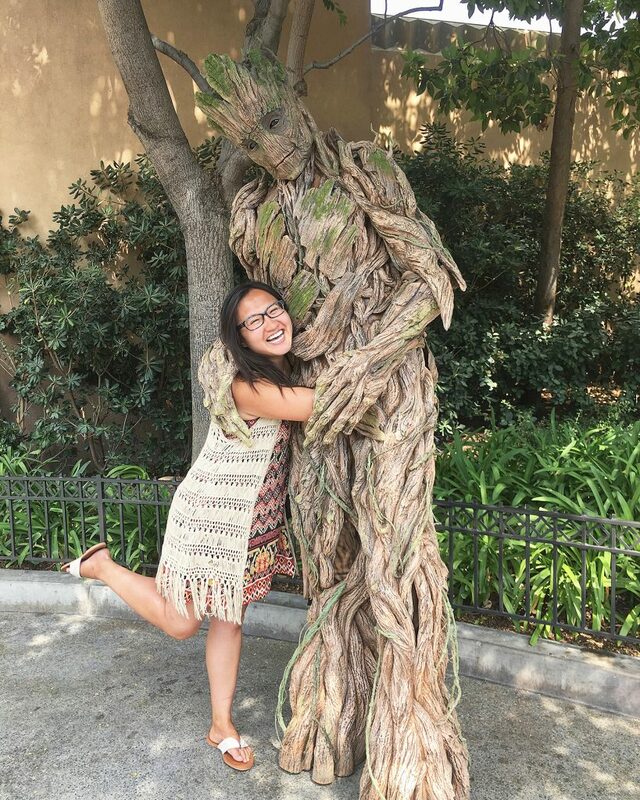 Bonus: Depending on the timing of your ride, you might luck out and meet Groot right after you exit! Eep. I love him. Bonus: after Mission: Breakout, meet Groot! 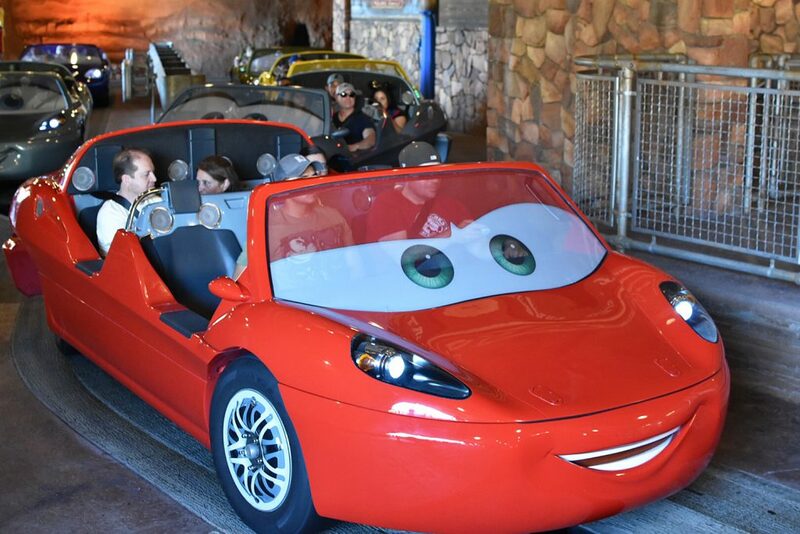 Head over to Cars Land for their awesome Radiator Springs Racers ride. I haven’t seen any of the Cars movies but the Radiator Springs Racers ride at Disney California Adventure raced right up to the top of my favourite rides. Pile into these cars for a journey through Ornament Valley before racing side-by-side with another car! You’ll race over hills, straightaway paths and around sharp turns – all set to the super picturesque Cadillac Range Mountains. Beauty setting for the Radiator Springs Racers ride at Car Land! The wind will blow your hair back and you’re sure to feel butterflies on the Radiator Springs Racers ride (up and down the valley hills creates some nice small drops!) I love this ride not only for the thrill and the really excellent animatronic talking cars, but also because of the beautiful race setting and big, open blue sky. 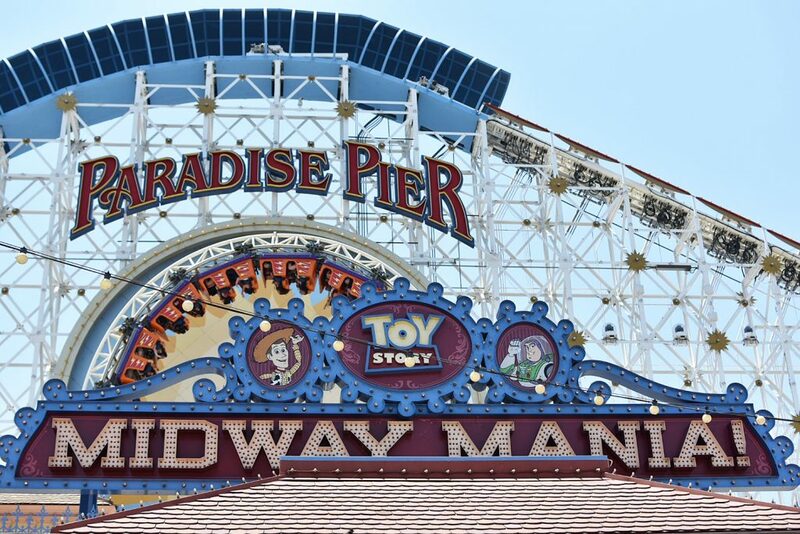 Paradise Pier’s Toy Story Midway Mania and California Screamer. I’ve played the Buzz Lightyear Space Ranger Spin ride over on the Disney side of the park (and at Disney World) before and thought it was sort of fun. I didn’t realize it’s WAY more fun older brother ride, Toy Story Midway Mania, was just across the way at California Adventure. In Toy Story Midway Mania you hop on this mid-way inspired carnival car where you use a launcher to aim at different targets in a bunch of carnival-themed games. You’ll throw eggs, toss darts, break plates, do a ring toss (on Toy Story 3-eyed green aliens) and blast a bull’s eye. It’s so much fun and you can see exactly where your target is hitting (unlike with the Buzz ride). All sizes, all ages can ride. So, in reviewing my Top 4 rides I’m noticing that they’re all located in the California Adventure park side of Disney. I’d say the more ‘adult’ and thrilling rides are definitely on this side but one of the more thrilling rides on the Disney side (in Frontier Land) is the Big Thunder Mountain Railroad! 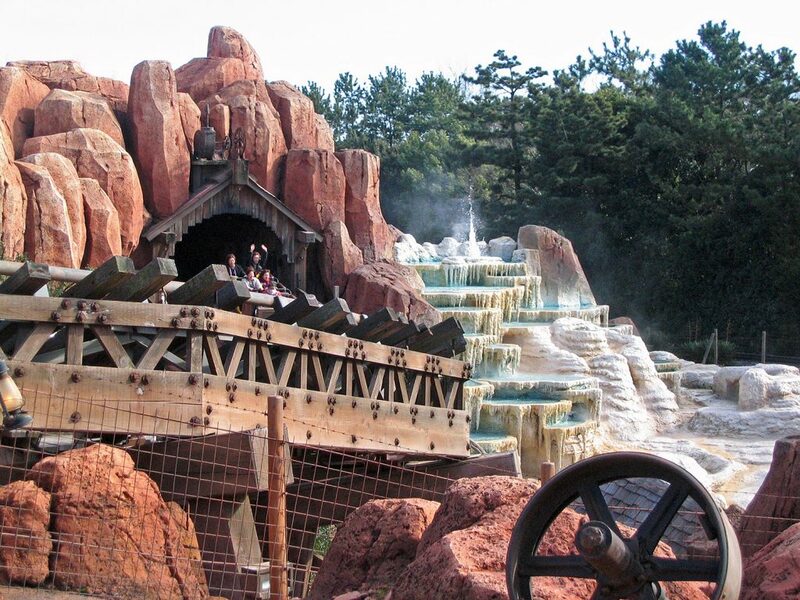 This rollercoaster-style ride takes you through a haunted mine on a speeding, runaway mine train. This ride is pretty wild – as you go up, down and around canyons and caves. Tall people, keep your head ducked because some parts of the ride look like they have low clearance!! Mickey’s Fun Wheel (non-swinging) is a great family-friendly ride! Mickey’s Fun Wheel on Paradise Pier California Adventure is a great ferris wheel that gives you the option of something wild or relaxing. Choose the swinging or non-swinging cart to decide what type of ride you want. The swinging carts seem like it would be a huge mistake (LOL!) We went with the kids on the non-swinging cart that gave us some fantastic views of the whole park (up 150 feet high) and at a really relaxed pace that was a nice break in between all the Disney parks crowds and madness. It would be nice to go during the day and night – for different views of the park! Space Mountain was my favourite ride at Disney over 10 years ago and today is still one of the best rides on the Disneyland side of the park. Located in Tomorrowland, Space Mountain is a high-speed rollercoaster (speeding rocket) that will take you across the galaxy. You’ll fly by bright lights, stars, comets and the remote blackness of the universe, all set to fairly frenetic music. It’s definitely one of the fastest, most thrilling rides on the Disney side of the park. We didn’t get to try the virtual reality ride Soarin’ – which takes you on a high-flying ride around the world – but I know based on our thirst for thrills and general enjoyment of virtual rides, that Soarin’ would’ve been on our list had we gone. This ride simulates you hang-gliding across some of the most scenic, awe-inspiring views of the world. Our friend Kristina, who lives in Anaheim and hung out with us for a portion of our Disney days, also highly recommended Soarin’. Be sure to check out Toontown (in Disney) and A Bug’s Land (in California Adventure) for various kiddy rides. Figure out your FASTPASS system! You can get Fastpasses to skip the line for most of the rides at Disney but a certain period of time must pass before you can get another Fastpass. You can get a FASTPASS for a ride about every 2 hours, so if done correctly – you should be getting a FASTPASS for one ride, getting in line for another ride, going for the ride in your first FASTPASS before getting another FASTPASS for more rides. If you’re bringing kids, I get the appeal of having little ones enjoying the magic of Disney but from an efficient-rides perspective, bringing a kid who is at least 7 years old is your best bet because they don’t need to be supervised by a parent, so you can take advantage of the often shorter Single Rider line! So that wraps up my list of best rides on our Disneyland adventure! There’s obviously a lot of rides at Disney, and it would seriously be impossible to do in just one day. We had a 3-day Park Hopper pass which I would highly recommend. With at least 3 days (and it really felt like 3 full days), we still weren’t able to try all the rides but I think we made a good dent (and went back for multiple trips on the rides we especially loved). Our taste in ‘best rides’ is also of course going to be different than others’ tastes. My friend Catherine was shocked I didn’t include Indiana Jones or Pirates of the Caribbean on my list! Both also very good rides. Feel free to leave a comment and let me know what your favourite Disney rides are! Pin + share my list of best rides at Disneyland + California Adventure!